Aren't these pretty! I absolutely LOVE crocheted cotton washcloths. I have a stack in my bathroom and I use them to wash my face with. The ribbing gives just the right amount of "scrub" to my face without being too harsh. These lovelies are from the Lion Brand Yarn website, and the pattern is here. 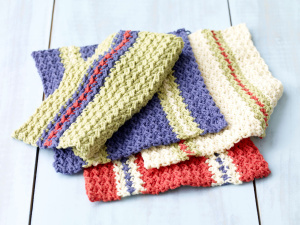 I also love to use crocheted cloths in my kitchen as well. I have a friend at church who knits me a new dishcloth every Christmas, and I use it faithfully. But the crocheted ones stay a little tighter over the year--the knit is much softer and drapier. Be sure to use cotton yarn for these. Wet acrylic is just nasty (and I say that as an acrylic yarn lover!). These cloths are great little presents for showers and housewarmings. They take little time to make, but wrapped around beauteous soap or funky kitchen tools--they look FAB. And it's a GREAT way to increase your skills with a small proect. Easy to tote, quick to finish! This page contains a single entry by MamaT published on May 4, 2010 8:12 AM. smock's monday thingie was the previous entry in this blog. Yummy Pattern Tuesday is the next entry in this blog.